Smoking your own meats doesn’t just save you a lot of money on gourmet store-bought meats, it is also quite an adventure. It is pretty exhilarating to give your very first smoked meal cook session a try. It is great fun to shop for the best electrical smoker for your unique need. It is even more fun to go and pick out all of the tasty foods you are planning on preparing in your smoker the very first time you give this food prep method a try. Seeking out that perfect spice and herb recipe to thrill all your friends is also quite fun but the best part about smoke cooking is seeing that first meal come out perfect at your very first try. If you want a memorable first smoke cooking experience then we highly recommend investing in the 28” Royal Gourmet Electrical Smoker. This smoker is stylish, just big enough for entertaining your family and a few other friends and is incredibly easy to use which makes it a perfect investment for beginners. The Royal Gourmet smoker has that same matt black square design as most smokers but the artwork of this little smoker is quite outstanding. It is fashioned with an eagle silhouette on the front door and also comes with handles as well as four lets that enhance the ease of using this device. Control – This smoker functions with analog temperature control with a 1500 watt heating element. The smoker can be adjusted to different heat settings and is fitted with a temperature gauge on the door so you can easily determine the internal heat. Capacity – This smoker consists of three chrome plated grids that can be adjusted to different heights. The smoker has dimensions of 37.1 x 19 x 20.6 inches which gives you a food capacity of 489 square inches that is certainly sufficient space for food prep for an entire family. Insulated – The smoker is fully insulated and even functions well during winter times. It also consists of a double-walled construction firebox to retain smoking temperature. 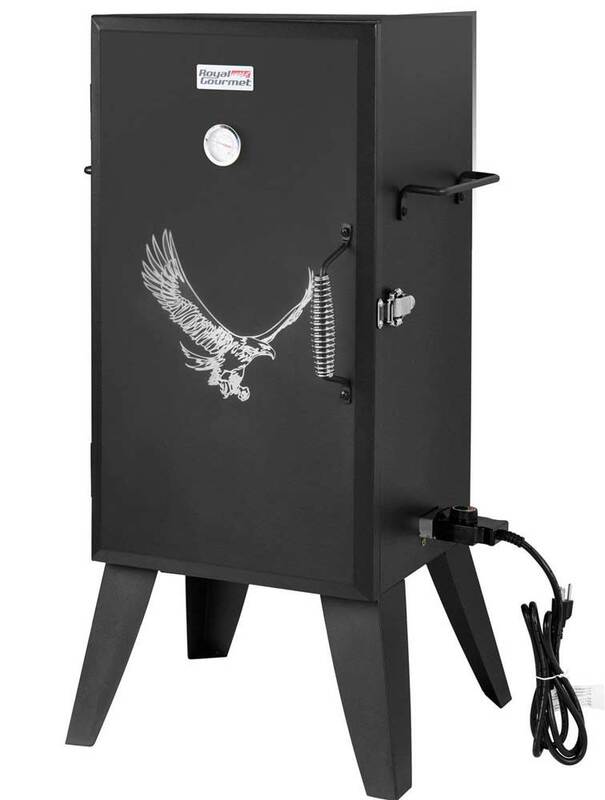 Extras – The smoker also has removable stainless steel water pan and a lidded chip box as well as a dual oil collection system that comes with a replaceable aluminum oil pan. On the door, it is also fitted with a coil spring door handle that protects your hand from burning. A door latch keeps the smoker sealed tightly to prevent the loss of temperature and smoke.